Local Business Marketing is a very important factor of any business to stand firm in the market. It is required by both the new startups and for the people who have an established business setup already. It is owing to the reason that there is a lot of competition no matter what sort of business you are doing. So, in this situation, if you want to be successful in your business, you have to do local marketing and advertisement of your business with new advertising ideas. There are different steps involved in doing the local advertising for your local business such as Planning, using the internet as a platform and much more. Above these advertising ideas, the one which stands out the most is the Paid local advertising for your local business. Paid local Ads are very important as they require a bit of investment but they produce a quick and a long term output too. There are different paid local advertising platforms running on the internet but the following is the detail of top 10 paid advertising ideas. 1) When you signup the local business page, after you fill in your business information, make sure submit up to 100% profile information to capitalized the search results. Some of the local pages like Google My Business requires postcard verification, so they will send a postcard to your business address, when you received it, you will need to input the code to activate the local page. 2) Plus, some of the local pages like Yelp, they require mobile text message verification, when you received their code, you will need to submit the code to the page in order to activate it. 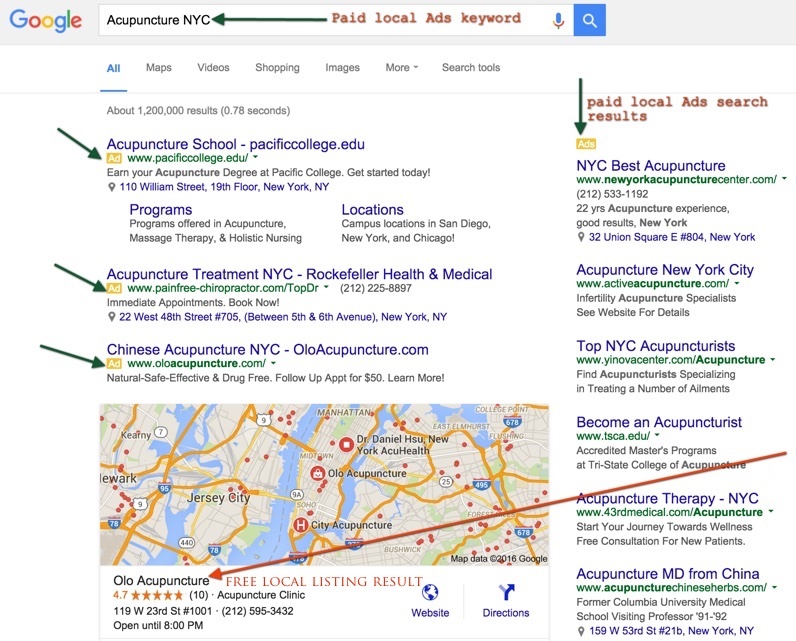 3) Make sure use Google Keyword Tool to research a targeted low competition keyword relevant to your business niche and use that keyword in all Local Page Titles to leverage better search engine results. 4) Make sure always use Google URL Builder to create a trackable URL and see your marketing report in Google Analytics to judge if your marketing effort working for you or not? 5) When users land on your business site homepage, you need to create a popup call to action page to grab their contact information and call them offline to get the marketing work done effectively. The basic idea of Google my business is to make it very easy to update the information related to your business on Google search engines along with Maps and Google+. It is the a sort of CRM(Customer relationship management)platform to be used for many small and big businesses. It is used to advertise your business on the search engine that you have the chance to be in the reach of people around you with the help of their cell phones or any other devices. They can search about your business and they will have the chance to find you as well to reach you to get a taste of your business. By using Google My business, you can also follow some businesses of your choice and post comments and reviews about your personal experience with it. 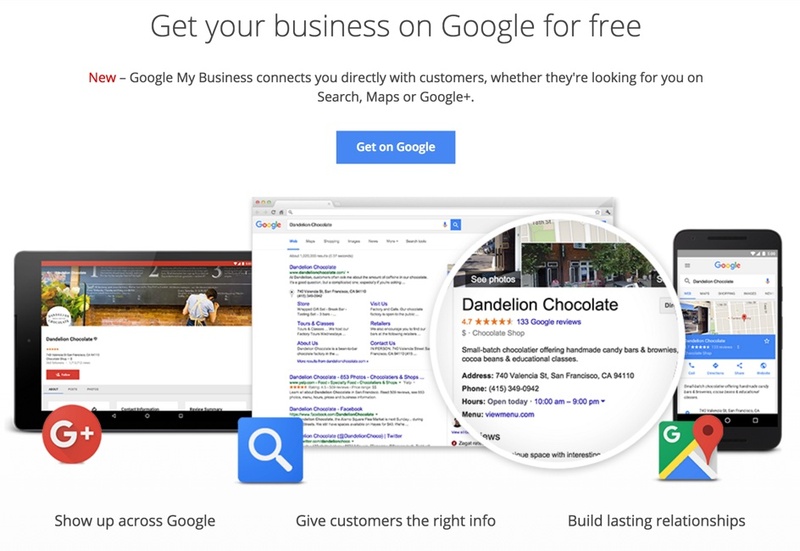 So, you can Sign Up Google For Business set your local business marketing on a very high note. Advertising on Yelp is a powerful way to reach customers who are looking for the goods and products you offer. 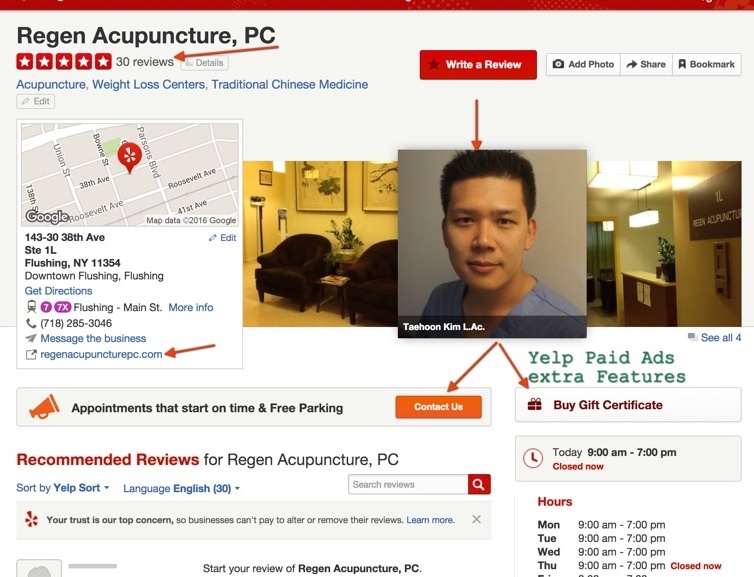 The main goal of the Yelp Ads is to drive you more leads and revenue. It is done with targeted Ads and upgraded profile for your business. 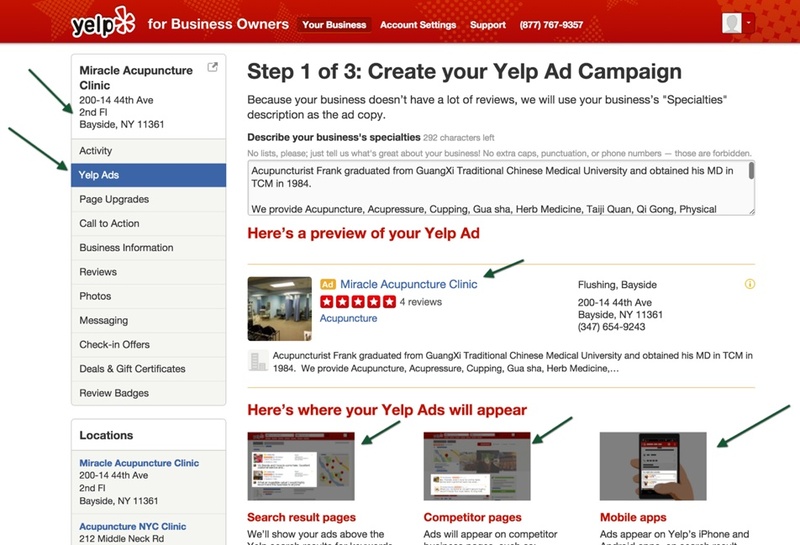 The targeted Ads on Yelp appear on plenty of places including Yelp search results and competitive pages. For example, if some are searching for a hair cut on Yelp the search will output the results of all the hair cut saloons nearby. It has different parts in it such as social page and business page. With the help of upgraded profile, you will be able to get more followers and clients for your business and products. There are two kinds of profiles one is branded profile and another one is enhanced profile on Yelp. In the Paid branded profile Ad features, the prominent options are the photo slideshow, video branding, call to action, social marketing, priority keyword search results and so on. All these things help you to announce different cool experience and drive user actions, which can help you to get clients thinking about your local business. In the Paid enhanced profile, everything is same as branded profile but it adds an extra feature of removing Ads of your opponent. 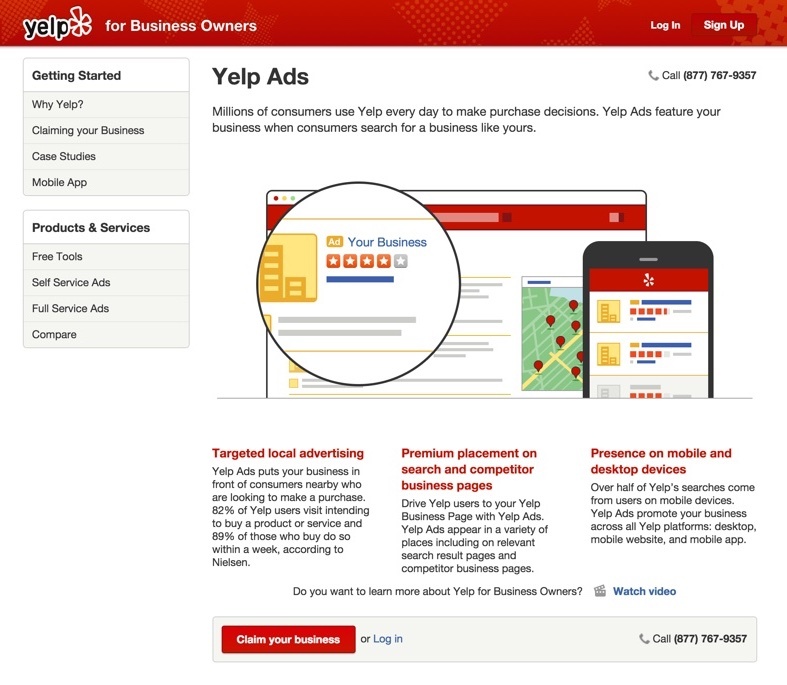 The call to action button will help get the customers from Yelp to your own website’s page. Yelp is known for local business reviews, like restaurant businesses. A business with lots good quality reviews acquired forms their customers will help to drive a lot of patron to the store. So you should give some incentives or coupons to encourage your local customers giving 5 stars reviews on Yelp and post back to your site to drive more buying decisions. 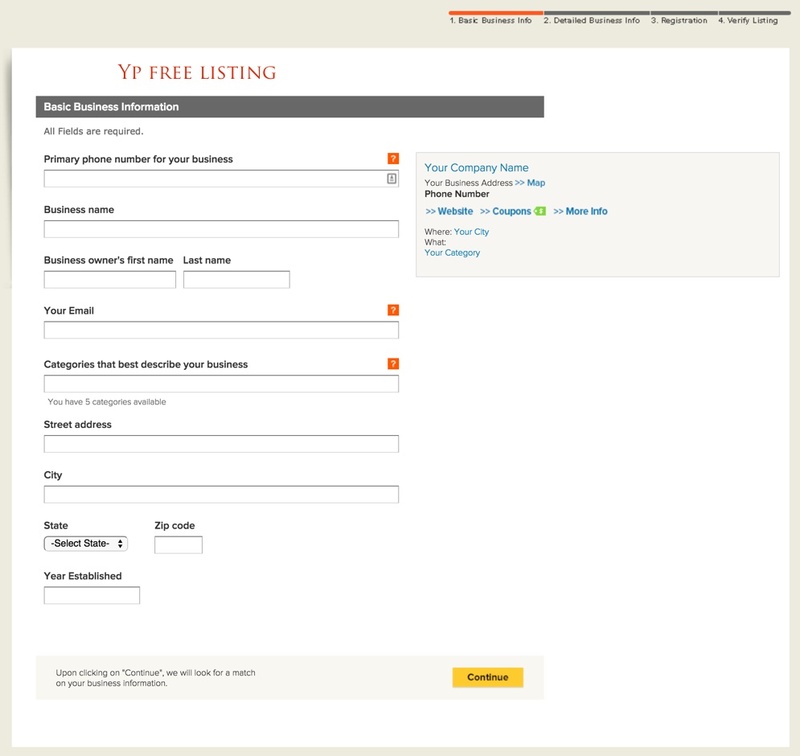 Here is the look that how can you advertise on Yelp Local. You will be asked to add the name of your business along with the nearest city and you will click on the get started button to start your local marketing experience on Yelp. After that, you will be shown a page which will contain the list of the businesses near your place and you will be able to add your business on Yelp by filling out all the information. After that, you can add images and videos on the page and business you have created by filling out all the information. The updates and title can be added by you. Your page will also be shown at the opponent page and many people who are looking to put in the search bar the products, which you are also offering. You will be able to setup your business on all kind of devices. You just need to update your page which will engage the local clients and people looking to get your products or business with you. So, Yelp has proven to be one of the best platforms for the Local business marketing with the help of paid advertisement. 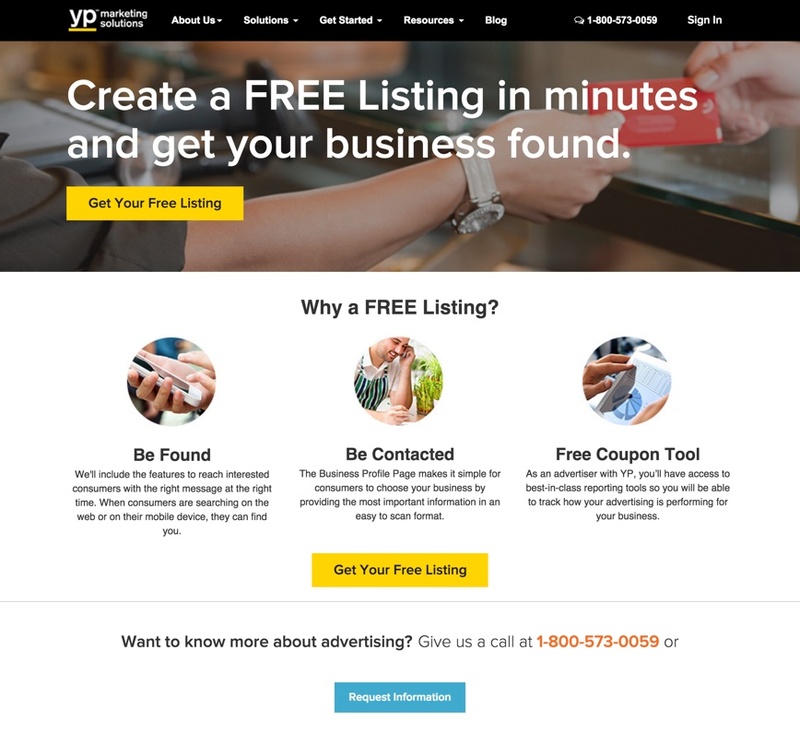 Yelp is my favorite Local marketing platform to choose among all of 10 Ads listed here because it is very targeted, locally oriented result drive advertising effort to help you bring more customers to your door. 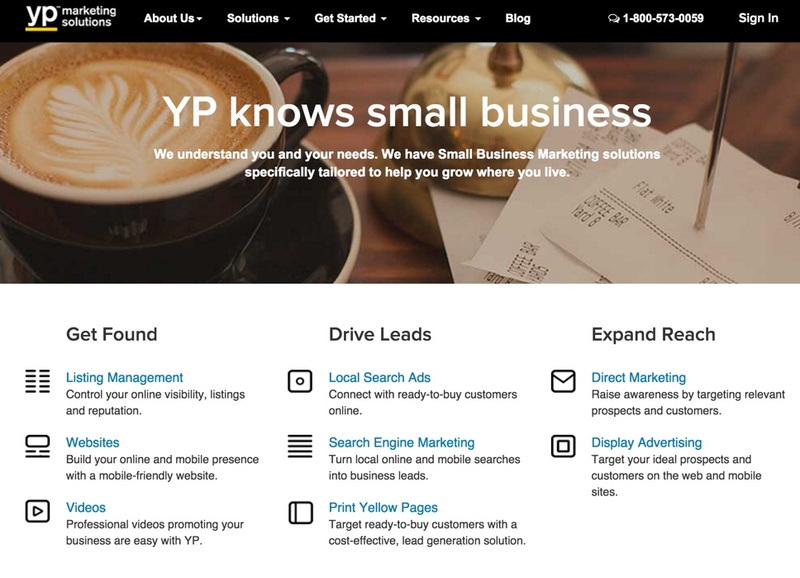 So if you have sufficient marketing fund, I suggest you to give them a call and find out more about how would Yelp local Ads would benefit your business? How Does Yelp Public Ad Page look like? Groupon for local deals Ads is great for local business that able to reach their massive targeted customers online. First, you will be contacted by Groupon sales rep, he will help your setup your Ads campaign for you like your business pitch sale information, Coupon, contact information etc. 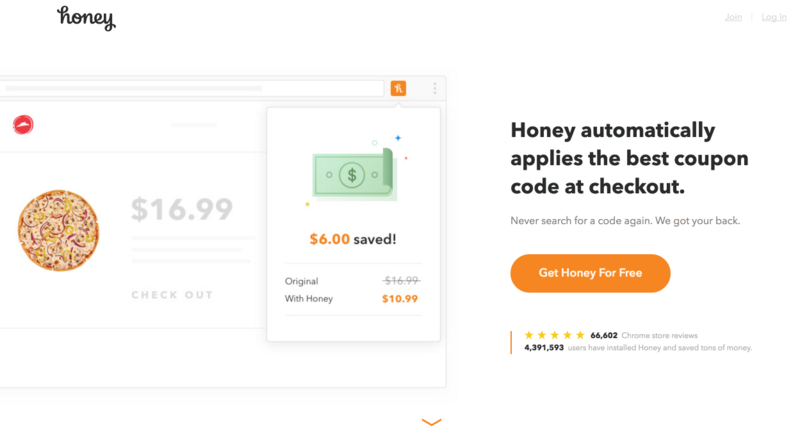 You don’t need to pay a dime for the coupons being sold on their platform, if any coupons being sold, they will take small portion of the actual price. 2) Groupon helps you promote your message to massive exposure like Radio, print, TV, billboards and social media sites. 3) Groupon has real loyal buying customers, 60% of customers were trying the merchant for the first time, 81% of customers have referred someone to the business. 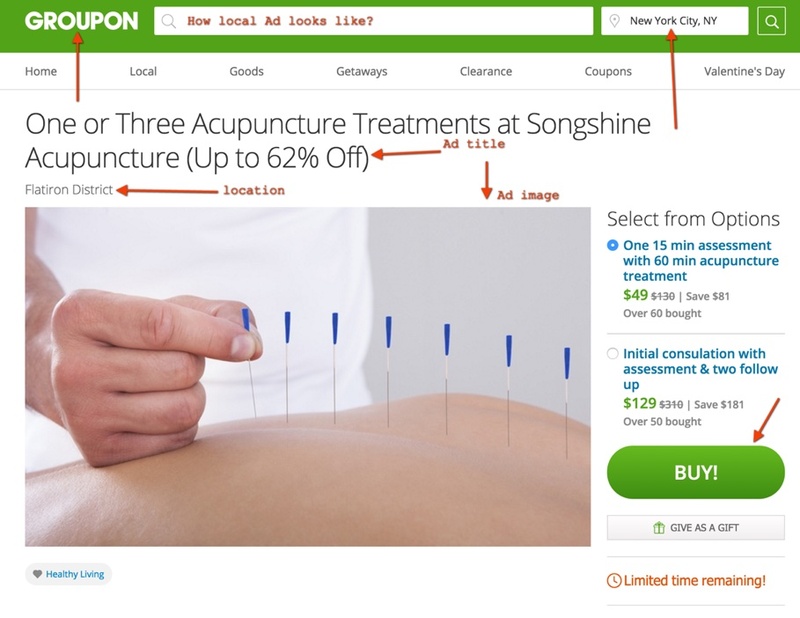 4) Groupon provides a mix of online, email, mobile and other social promotions to meet your business goals. 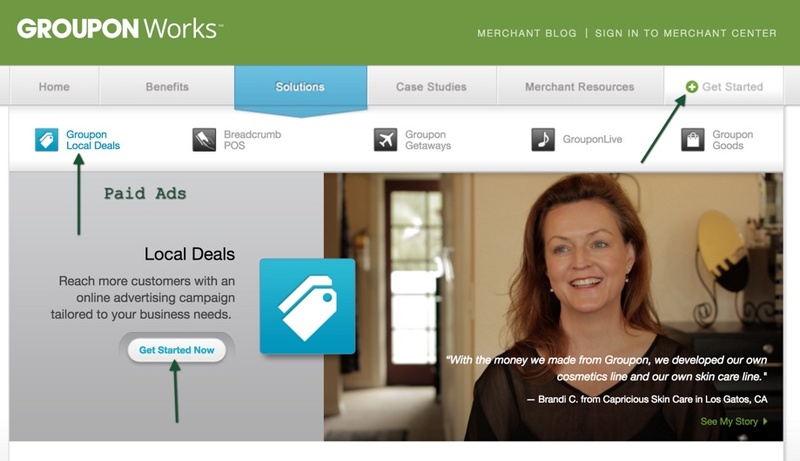 5) Groupon dashboard helps you track your on-going marketing reports and analytics such as clicks, views, and sales. Facebook has been a revolution in the world. It has brought the people near each other from all parts of the world. It has been a great help for local business marketing too. It has helped many people to advertise their local businesses with its help to take them to a level where they became the favorite business around. Facebook paid local advertisement Ads are low cost and it will produce the local marketing results in shortest of time. It has a simple setup and it has the ability to target the right GEO-Targeted audience according to your business niche. 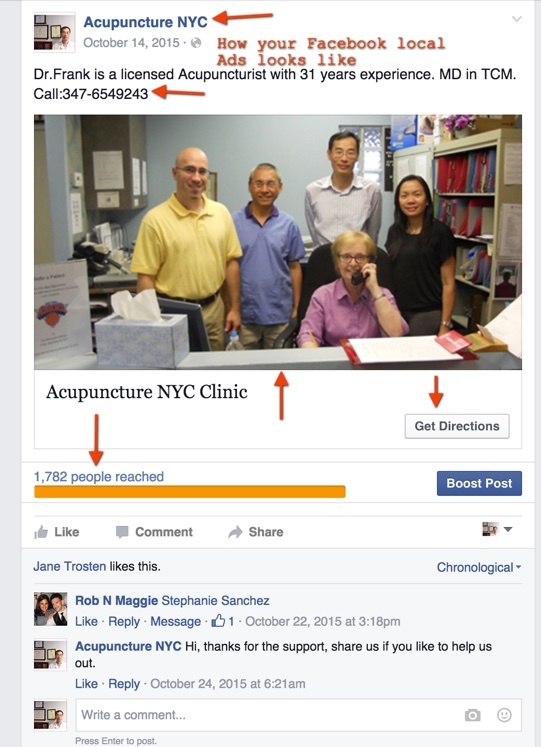 It helps people to reach your post, it stops people from ignoring your business or posts. So, a Facebook advertisement for local Business is growing day by day owing to its excellent results. Go to the page facebook.com/business/goals/drive-in-store-sales, click the top right ‘CREATE PAGE’ tab, then choose the first one said ‘Local Business or Place’, then choose a right business category to match your business niche, fill in your business address to get started. You can add your 100% profile information to the about page and after that, you can add a decent profile picture which can be a Logo or any picture of your product. You have the extra option to add your preferred audience which will relate to your business. 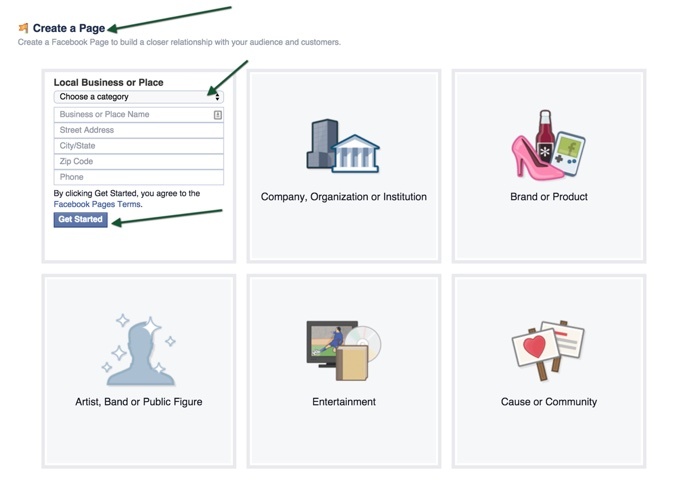 After completing all steps and after filling all the necessary information, you will be provided with the ready Facebook business page. In this page, you can update your cover picture, profile pictures, Street Address, phone number and many more things to along with a call to action button to promote your local business around your local area. 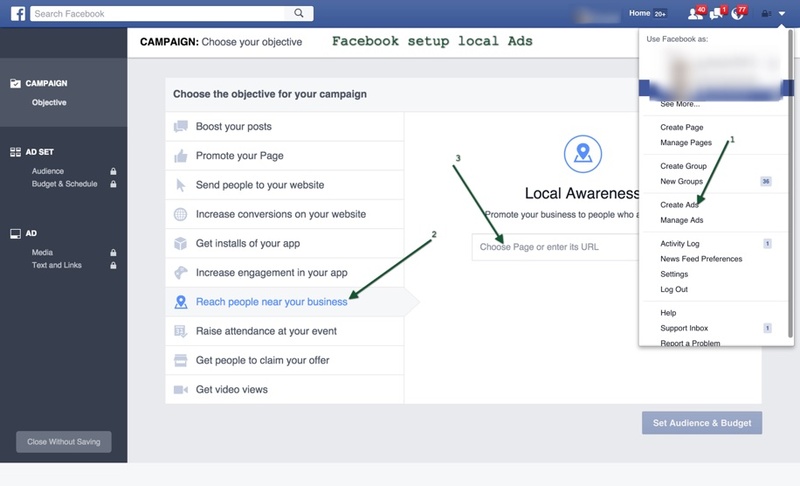 With the help of these Facebook Ads, people will be able to search you and know about your local business. They will be able to search you out when they will see that you are offering services near them which are required by them. So, Facebook Local Ads are one of the best and up going activity for the people who are looking for local Business Marketing. Twitter has proven to be something very special for the people around the world to fulfill their needs of social connections. Not only this, Twitter has increased its worth by giving people the opportunity to publish their local business to let the people around your area to know about your business. 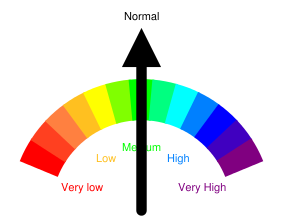 There is an option on the Twitter Ads which will help your GEO-Targeted audience. You can start a new business page or you can start a campaign too. Another feature of Twitter Ads is that you can also target your business launch according to the language of the people of specific areas. There are options for all the cities around the world. For example, you are promoting your business in your area local area in France, you will be looking to target the French people with French descriptions and images. When you Login your Twitter account, go to the top head right area, click your profile icon, then shows a popup window, then click ‘Twitter Ads’. After that, click ‘Create new Campaign’, then shows a popup window, then click ‘Custom’. You will be asked to Set up your campaign, give it a name, choose to run it right away or later. Set a total budget (optional). Compose Tweets, make sure use trackable URl for Google Analytics. You can always login to your Twitter account ‘Twitter Ads’ dashboard to check your marketing performance and help you make better decisions. 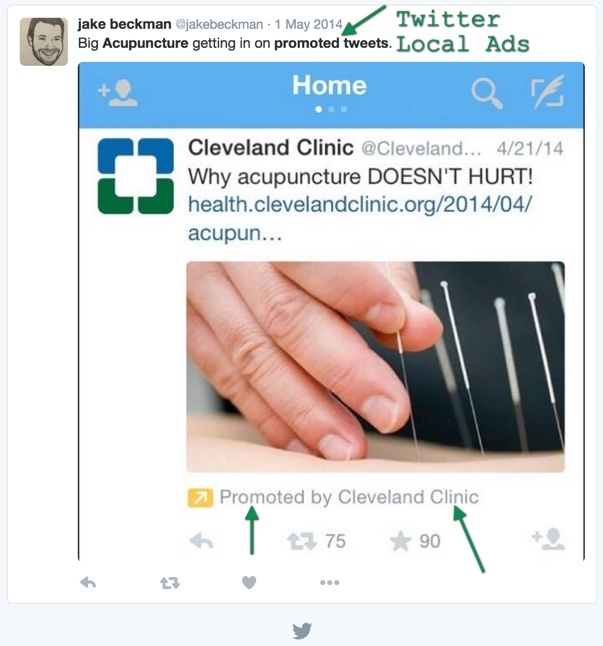 So, this is how local advertisement can be done with the help of Twitter business Ads. StumbleUpon Ads is the most latest and innovational site for the local business marketing. It has been a great help for the entrepreneurs to advertise their products and get a positive response in a short amount of time. All you need to do is provide with a URL and it will design and code it for you. It is a revolutionary local business marketing site because it let you target your desired audience, it will let you select your relevant categories by providing a vast selection from 500+ categories, and it will help you control your budget by obtaining a minimum amount per visit. Once you have started your campaign you will start seeing results in a short amount of time. The more people you attract the more free visits you will get apart from that it also offers regular monitoring and changes in your planning and it will find your desired audience for you. Here are the steps that will help you accomplish your local business task with the help of StumbleUpon Ads. 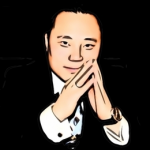 Go to stumbleupon.com/pd/auth/signup, You will be asked to create an Advertising Business Account by providing following information to sign up. You will have to verify your email address for security purposes and once your account is activated then you can start your campaign by providing the desired interest and them you can easily stumble by pressing the stumble button. If you want your business to be advertised worldwide then Reddit help is one of the best local business marketing sites. 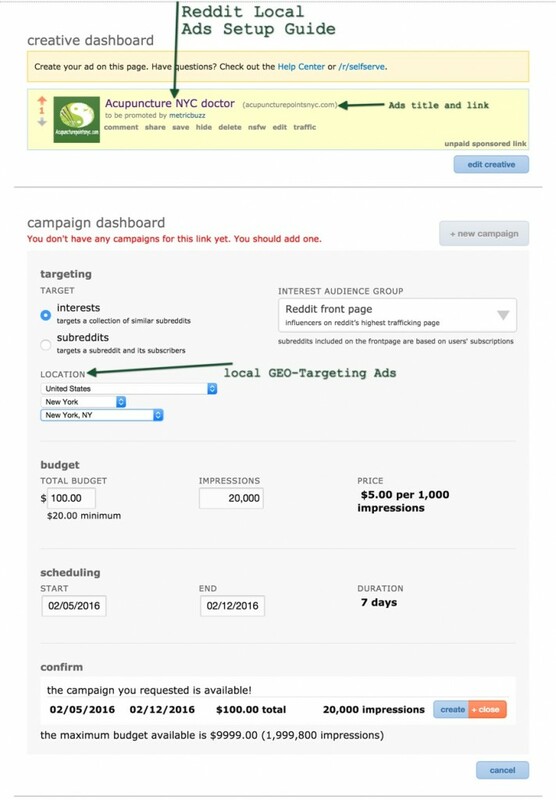 It will also let you target your desired by selecting them in the targeting section. You can also use city level advertising by using your target city. It is one of the widest local business marketing website with a 170,000,000 incredible visitors every month that will give their response by Upvoting or Downvoting your content. It helps you interact with your clients and get their attention in a creative manner and you will notice that your business will see a new level of success in a short amount of time. Following are the steps required to get started on Reddit. First, you will have to create a Free Account in order to submit your links for the Reddit Upvoting. It will be done quickly and it will not ask for email confirmation. All you have to do is go through sign up process. Then you will need to go to this page reddit.com/advertising, login to create an Ad Content there. You need to upload a Thumbnail, create your Ad Title, and your business website URL. Finally, you have come to Ad campaign page, fill in your necessary information there, especially local GEO-Targeting location information for you local business marketing. It is the advanced way of local business marketing. It helps you gain a good repute and a large number of clients in a little time. It will meet all your local search requirements and advertise your business in front of 160 million people. It is your pretty effective local business marketing platform. 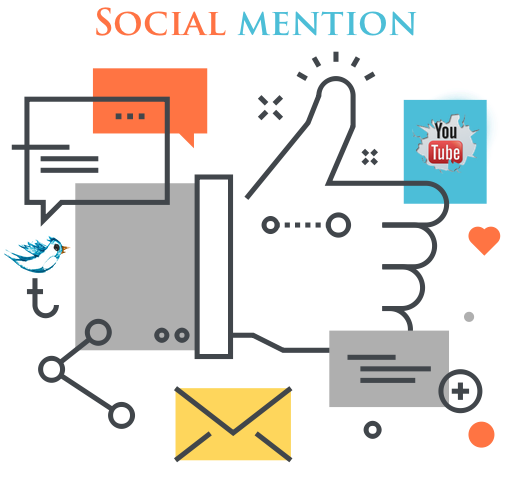 It will provide you with the advance local business marketing solution that when you formulate your advertisement using them you will attract a good sum of clients. It will help you gain trustworthy and paying customers that are your main goals and thus help you enhance your local business. 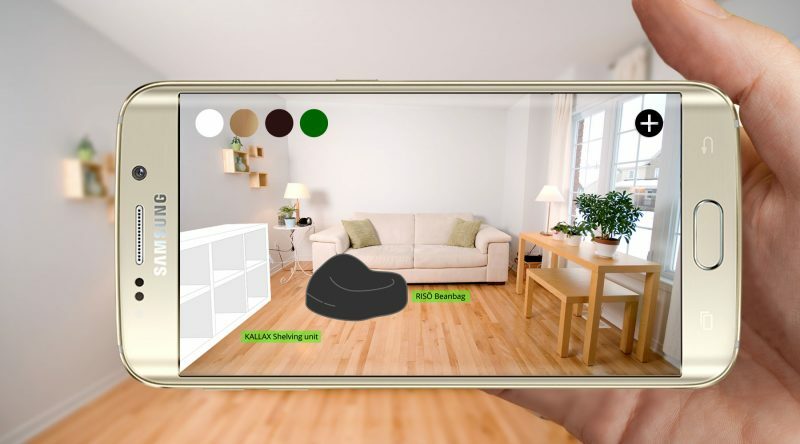 It will help you connect with the customers in an attractive way. In addition, display your business adds to help you gain customers. 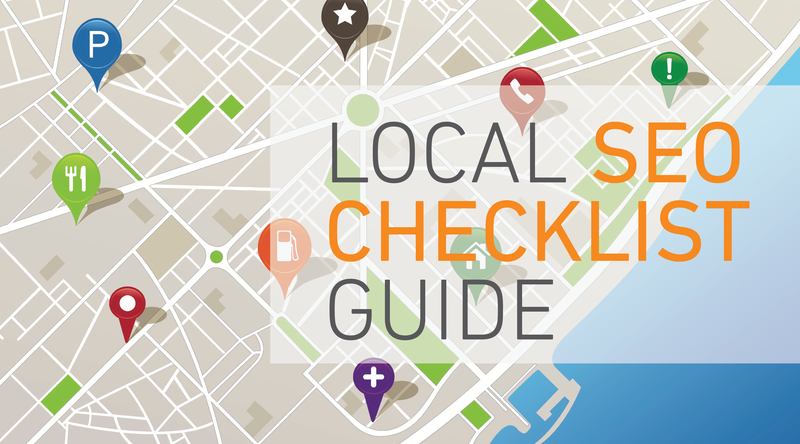 Submit your basic and detail information up to 100% profile to maximize local visibility results. 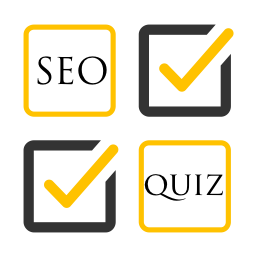 Verified your free listing according to its rules. 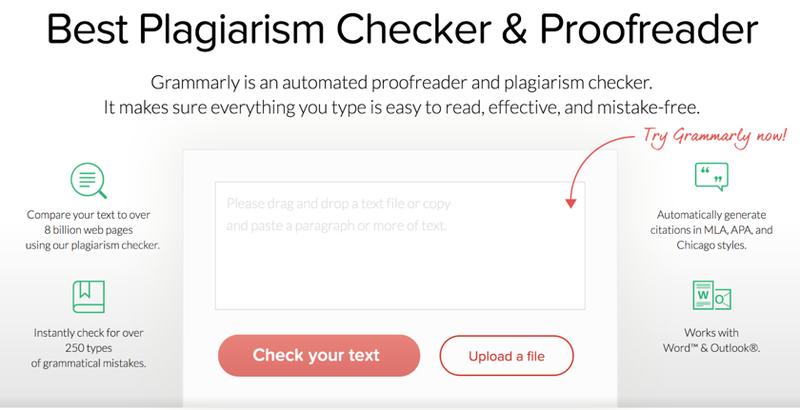 Then, you free listing is official publish and live. It is the latest way of local business marketing. It helps you buy only knowing the information of your business and formulates the best and attractive Ads for you, they are not only displayed on local pages but also on your competitor’s site. The best feature of this website is that 20 million people visit it daily, which means that it will be your best way to success. Thus, we can say the Manta Ads provides one of the best local business marketing services that make your business known in a short amount of time. To get started, you have to sing up and cliam free listing on the website. You can sing up directly or by using Facebook or Google+. So, Manta is growing fast day by day all the business man who is looking for promotion along with traffic to their local business are getting benefits from Manta day in and day out. You just need to follow the above instructions even to start your own company. So, Get on Manta to have the perfect experience of local marketing your business. How does Manta Ads work? It provides you with large numbers of categories and thus you can simply select and post your add according to your business. An easy to use local business marketing site helps you display your product in front of millions of visitors daily and thus gain you a high repute and customers. 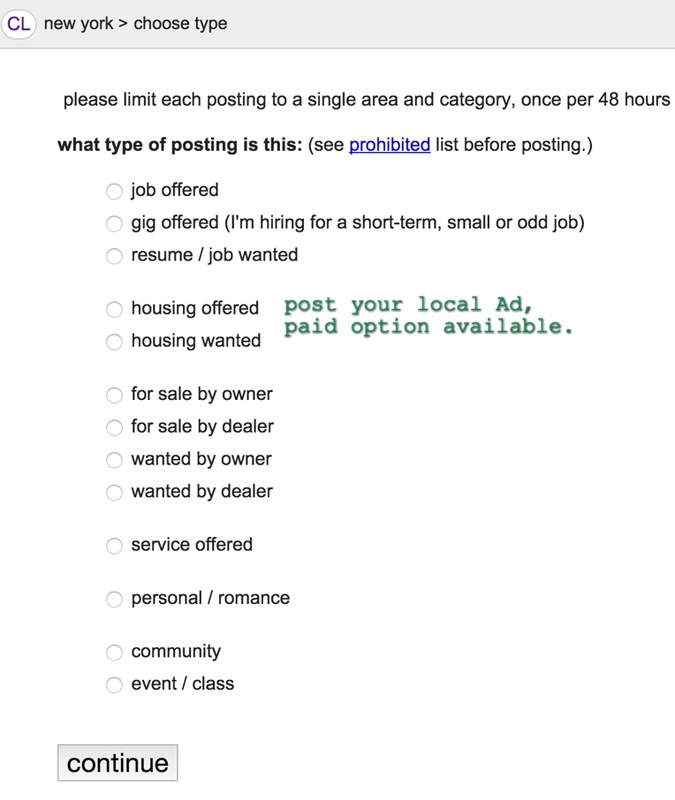 It is free to post a basic local Ad, you can upgrade to the Paid Ad for more local exposure if you want. Follow the gives steps and get your product advertised to a million customers daily. You can simply create your account by providing your email and you can get started on the site by activating your account by selecting a password. Select the category of your business and the post about it and see the positive feedback in little time. For the people who are doing small business in any small area of the world, this is one of the best platforms to market and advertise their local business. You have the chance of identifying your market and you build Ads according to that. It is a safe place to sell as you can track your results and reports too. 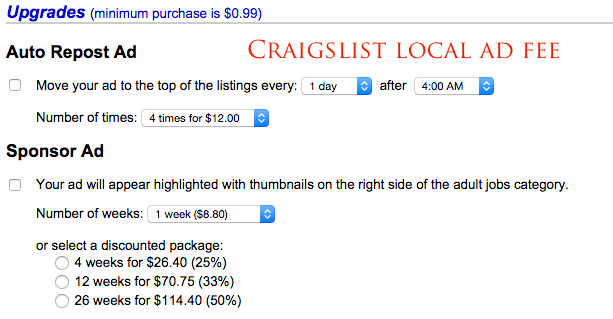 So, Craigslist is doing a great favor in helping people in the local advertisement of their local business. These are the details of the top 10 local marketing paid Ads used for local advertisement of your local business with different advertisement ideas. So, I hope this will give you a proper view of how to get on these platforms to start promoting your business. You need great content for your business when comes to marketing, check how to Design Better Content Guide. You can also find pretty affordable graphics designers or web developer on Fiverr.com to help you get the job done.